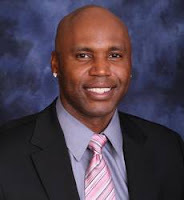 Cornelius Clifford Floyd was born on December 5, 1972 in Chicago Illinois. His father worked two jobs in order to have the family live in a safe suburb outside of Chicago. Cliff was a star baseball player but passed up college baseball scholarships when the Montreal Expos made him their first round pick (14th pick overall) in 1991. He hit 16 HRs with 98 RBIs & a .304 average in A ball in 1992 getting promoted the next year. He went from AA to AAA quickly hitting a total of 28 HRs & 119 RBIs, which earned him a September cup of coffee. In 1994 he made the regular Expos squad as an outfielder. This was Felipe Alou's first place Expo team that may have very well won it all if not for the Baseball strike cancelling the rest of the season. In 100 games he batted .281 with 4 HRs 41 RBIs 19 doubles & a .332 on base %. He came in fifth in the Rookie of the Year voting. He suffered an injury limiting him to just 29 games in 1995, then slowly began to develop in Montreal through the 1996 season. Post Season: In the World Series against the Cleveland Indians he went 0-2. By the next season he was becoming a solid player hitting 22 HRs with 90 RBIs but injuries kept nagging him. If Floyd was healthy he may have been one of the games top players, in 1999 he was limited to just 69 games batting .303. His next three years in Florida were big ones, he drove in over 90 runs each year hitting over 22 HRs as well. His biggest year was 2001 when he hit 31 HRs with 44 doubles (7th in the NL) 123 runs scored (6th in the NL) 103 RBIs batted .317 stole 18 bases & posted a .390 on base %. At first he wasn’t named to the 2001 All Star team and he criticized Mets manager Bobby Valentine’s decision not to name him to the squad. After an injury opened a position, Bobby V named him to the squad; it was his only All Star appearance. 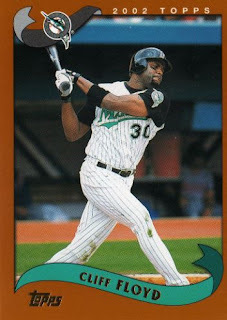 In 2002 he went from Florida back to Montreal then briefly to Boston hitting 28 HRs with 79 RBIs combined and batting .288. 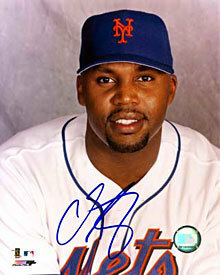 In 2003 he was signed by the New York Mets as a free agent. 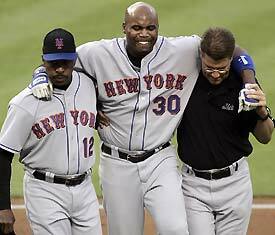 Floyd would spend the next four seasons as the Mets left fielder, when he wasn’t injured or on the disabled list. 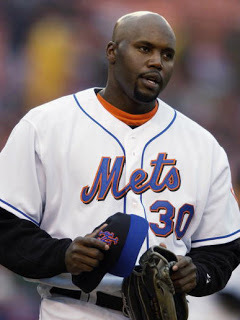 He debuted on Opening Day 2003 going went 0-4 in the Mets Opening Day loss to the Chicago Cubs. The next day he hit a two run HR, leading the club to a 4-1 home victory. In May he hit eight HRs with 24 RBIs, including a grand slam in Milwaukee on May 4th, leading to a 5-3 Mets win. In June he hit HRs in back to back games during interleague play when the Mets hosted the Seattle Mariners. Three days later he drove in five runs, with a HR & three hits in the Mets 8-2 victory against the Texas Rangers in Arlington. After a decent July he drove in a dozen runs in the first part of August, including a four RBI day on August 16th against the Colorado Rockies. Then on August 18th, his season was cut short as he went down with injury. In his first season in New York, Floyd hit .290 playing in 108 games. He tied for the team lead in HRs with Jeromy Burnitz (18) and also lead the club in walks (51). He also hit 25 doubles while driving in 68 runs with a .376 on base%. 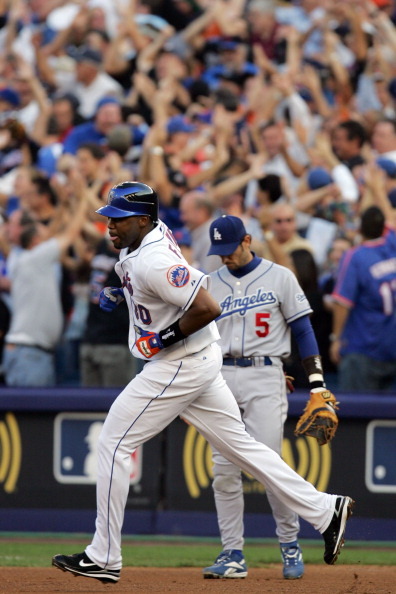 In 2004 he began the season with a HR in the third game of the year, helping in a 3-2 Mets win. But then he missed a month of action going down on the DL once again. He returned in mid May, and in his second game back hit a grand slam off the Astros Roy Oswalt in Houston. On May 18th he drove in the winning run with a walk off single against the St. Louis Cardinals & former Met; Jason Isringhausen. 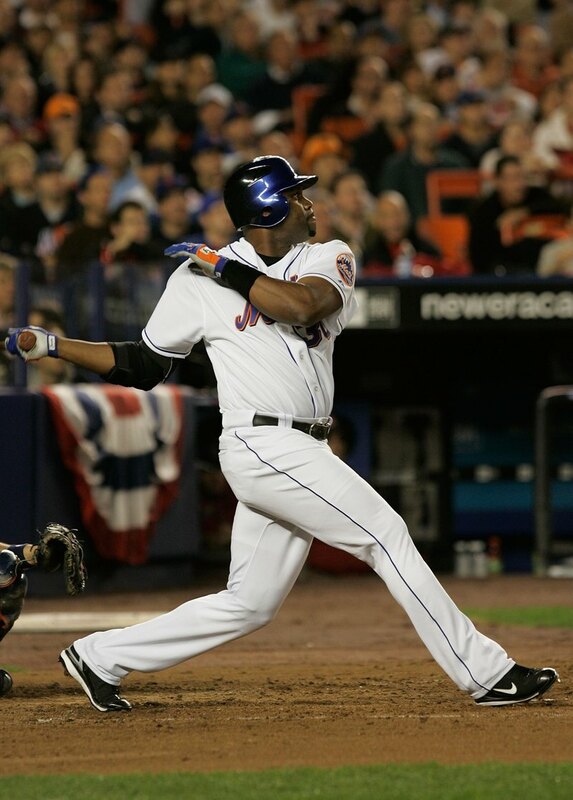 In the week of June 10th, Floyd drove in runs in five of six games, although the Mets lost all but one of them. On June 29th he led the team to a win bashing a pair of HRs in Cincinnati against the Reds in a 7-5 win. He had a good start to July hitting three HRs with nine RBIs in the first week of the month. 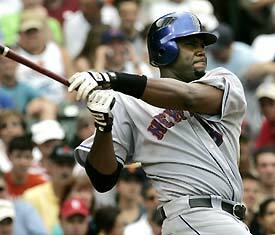 On July 3rd he hit a big three run HR at Shea Stadium, off Jose Contreras leading the Mets to a 10-9 Subway series win. He started out August with a bang as well, driving in seven runs in the first week of that month. On August 14th he hit a two run HR & drove in another run ,leading the Mets to a 4-3 win over the Diamondbacks. In September his only HR came against the Atlanta Braves in a 7-0 Mets win. His season ended early, as he got injured again on September 18th. He finished the 2004 season batting .260 with 18 HRs 26 doubles 63 RBIs (second most on the club) & a .352 on base %, (second to Mike Piazza .362%). That year the Mets finished fourth under Art Howe. In 2005 the Mets were improving, with a new manager Willie Randolph & the off season signings of Pedro Martinez & Carlos Beltran. Floyd would have his best season in New York that year as well. Mainly because he stayed healthy playing in 150 games. He led the club with a career high 34 HRs (8th in NL). He drove in with 98 runs (second to David Wright's 102) with 22 doubles, a .273 batting average, 12 stolen bases & a .358 on base %. Defensively he was second among left fielders with a .993 fielding % making 15 assists. That year he received votes for the NL MVP Award. Floyd had an early season 20 game hitting streak, while driving in 20 runs in the month of April. On May 13th he hit two HRs against the St. Louis Cardinals, & drove in both runs of a Tom Glavine combined five hit shutout. Later in the month, he drove in the only run of a Pedro Martine eight inning five hit shutout performance in Florida. He had a hot June hitting in all but four games, with nine HRs & driving in 16 runs. He hit two HRs on June 5th, in the second game of a 12-1 double header sweep over the San Francisco Giants. On June 11th, he hit a huge three run walk off three run HR, against the L.A. Angels Brendan Donnelly for a 5-3 Met win. On June 24th he opened up the subway series matchup across town, with a HR off Mike Mussina in a 6-4 Mets win. 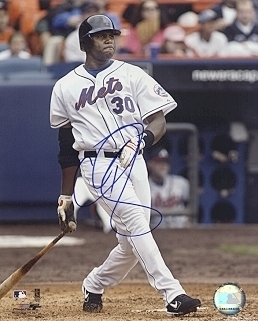 The next day on June 25th he hit two HRs while driving in four runs in the Mets 10-3 victory. Both his HRs came off Sean Henn, helping the Mets take the first two games of the Series. In August he drove in runs in nine of his first twelve games played, raising his average to .290. On September 15th he hit a grand slam at Shea Stadium, off Livan Hernandez of the Washington Nationals. The Mets lost the game when Vinny Castilla singled home the winning run off Roberto Hernandez in the top of the 10th inning. In the month he hit HRs on back to back days twice, the first time on a road trip to Florida & the latter at home against the Atlanta Braves. He finished the month with seven HRs & 18 RBIs. In 2006 he was surrounded by a good team with better hitters all around him. A long personal history of Injuries began to wear him down & wind down his career. He struggled at the plate at first not reaching the .200 mark until May 18th. He missed almost all of June as well as most of August with injuries. When he was playing he wasn't the same hitter. In APril he drove in eleven runs although he hit just .185. On May 5th after the Atlanta Braves took the lead off Billy Wagner in the top of the 11th inning, Floyd delivered with a solo HR to tie it back up in the bottom of the inning. The Mets won it in the 14th on David Wrights walk off single. 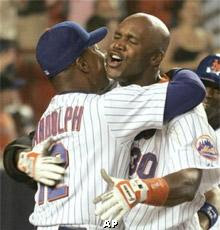 In July Floyd had two of his biggest days of the year; first a three hit five RBI day against the Florida Marlins at Shea Stadium on July 8th. That day the Mets beat the Marlins 17-3 in the night cap of a double header. Then the next week at Wrigley Field in Chicago, he hit two HRs & had another big five RBI against the Cubs in a 13-7 win. He only appeared in 97 games in the Mets 2006 NL Eastern Division winning season, batting .244 with 11 HRs 26 doubles 44 RBIs & a .324 on base %. 2006 Post Season: He had a good NLDS against the Los Angeles Dodgers , starting out with a Game #1 HR off Derek Lowe at Shea Stadium. In Game #2 he had a 6th inning single off Brett Tomko, & scored a run on Julio Franco's force play, in the Mets 4-1 win. Overall he batted.444 getting four hits in nine at bats. 2006 NLCS: His NLCS against the St. Louis Cardinals wasn’t as good. He was injured again and just went 0-3 appearing as a pinch hitter. His last Mets at bat came in the 9th inning of Game #7, when he struck out looking Adam Wainwright for the first out of 9th inning. The Mets did not resign him in the off season & Floyd went home to Chicago signing a one year deal with the Cubs. There he batted .284 with 9 HRs & 45 RBIs in 108 games. In 2008 he went to Tampa playing for the AL Champion Rays as a fourth outfielder. In 80 games he hit .268 with 11 HRs 13 doubles & 39 RBIs. He got to another World Series going 4-18 in the post season as a reserve outfielder. He hit .333 in the World Series against the Philadelphia Phillies going 1-3 in three games. In 2009 he played in just ten games with the San Diego Padres but was released in October. In a 17 year career Floyd played in 1621 lifetime games hitting .278 with 1479 hits 233 HRs 865 RBIs 340 doubles 23 triples 601 walks 1064 strike outs and a .358 on base %. 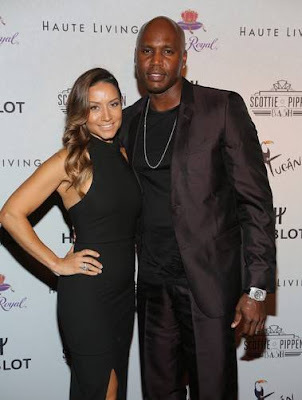 Retirement: Cliff Floyd lives in South Florida with his long time partner & wife Mary. They have two children together. They are involved in an annual bowling charity in South Florida, which involves the Miami Marlins team as well. Cliff & Mary Floyd have gone into business with UnFranchise & have became executive coordinators in Market America & shop.com. In Spring Training 2015, he broadcast his first Mets game for SNY as an analyst with Gary Cohen. He had a small part time job with them during the season. 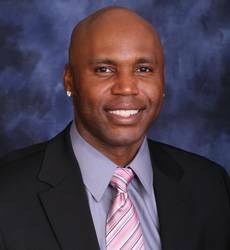 Floyd also has worked as an analyst for FOX Sports baseball Night America, Sirius radio's MLB Network, the MLB TV Network, Fox Sports Florida as a Marlins broadcaster & as of 2018 Sportsnet as an analyst with the Toronto Blue Jays. Floyd was on hand in New York for festivities surrounding the 2013 MLB All Star Game at Citi Field.